Telephone: +91 22 2207 4333. This useful office by Churchgate train station provides information on all of India as well as the city of Mumbai and Maharashtra state. They also maintain desks at the international and the domestic airports. This magnificent railway station, formerly Victoria Terminus, was completed in 1888, and remains one of the greatest British-built constructions in India. Designed by FW Stevens, this UNESCO World Heritage site features a fantastical amalgamation of Indian and European architectural styles. It's adorned with domes, turrets, spires, stained-glass windows, gargoyles and intricate carvings of plants and animals found on the Maharashtran coast. As India's busiest train station, it's worth visiting just to witness the incredible crush of humanity. Telephone: 139 (in India only). Daily early morning to late evening. This huge triumphal gate was constructed for the 1911 visit by King George V, but wasn't completed until 1924. Rather ignominiously, it was the setting for the British Army farewell parade when India was finally handed back to the Indian people in 1948. Designed by George Wittet, it blends Hindu and Islamic styles, and it's a favourite meeting spot and the starting point for boat-rides to Elephanta Island. Mumbai's biggest, and perhaps best, museum is housed within a grand domed building built in classic Indo-Saracenic style. 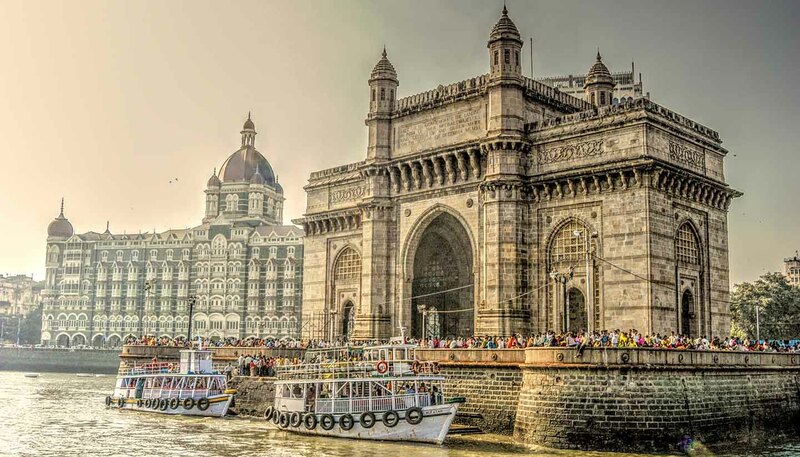 Opened in 1923, it was designed by George Wittet of Gateway of India fame. Inside, the eclectic collections cover everything from Hindu and Buddhist sculptures and miniature paintings to weaponry and stuffed animals. It's also worth exploring the peaceful grounds. Admission includes a helpful audio guide. Telephone: +91 22 2284 4484. Commonly referred to as Bombay University, this imposing gothic building was designed by Gilbert Scott in 1857 and is one of India's oldest universities. The University Library and Convocation Hall were once open to the public, but access has been limited to students since the 2008 terrorist attacks. It's still impressive when viewed from outside, with gothic spiral staircases and the Rajabai Clock Tower looming 80m (262ft) above the Oval Maidan. Telephone: +91 22 2270 8700. Built on reclaimed land, Marine Drive is Mumbai's most famous thoroughfare. Lined with grandiose Victorian buildings, ageing art deco apartment blocks and palm trees, the road runs down Back Bay from Malabar Hill to Nariman Point. At night it twinkles with streetlights, earning it the nickname 'Queen's Necklace'. At the top end is Chowpatty Beach, the only strip of sand in central Mumbai and a favourite spot with locals for evening strolls. This historic Hindu temple in the heart of Bhuleshwar Market was built to honour the city's patron goddess Mumba Devi (whose name was reputedly the source for the English word 'Bombay'). While not spectacularly ornate, the temple throngs with activity and has formed the spiritual heart of the city for more than six centuries. Devotees queue daily to pay their respects to Mumba Devi, an incarnation of the Hindu mother goddess. Telephone: +91 22 2242 4974. The Mahalaxmi Dhobi Ghat is where Mumbai's vast quantities of dirty laundry arrive to be washed and aired by a legion of hard-working dhobi-wallahs (washermen and women). Every day, hundreds of bags of laundry are delivered to the ghats and are washed in row upon row of open-air troughs. The view from the flyover outside Mahalaxmi train station is quite remarkable. Mumbai's most famous strip of sand is no Waikiki, but the beach is special toMumbaikers thanks to the many Bollywood movies that have been filmed here. Much improved in recent years, it's still a place to promenade rather than swim, particularly at dusk, when the sand overflows with locals taking the sea air, and hawkers selling plates of bhelpuri (Mumbai-style noodle salad). This grandiose hotel has been a Mumbai icon since it was constructed in 1903. Built by J.N. Tata, the Parsi industrialist, after supposedly being refused entry into one of the city's European hotels for being "a native", it has since hosted everyone from The Beatles to Bill Clinton. It recently hit the headlines after a terrorist siege, but with tightened security and the damage repaired, it's worth peeping into the lobby or dropping by for dinner, even if you don't stay. Telephone: +91 22 6665 3366.